Microsoft has reported a slight dip in profits despite record revenues and a good boost in sales provided by the launch of the Windows 8 operating system last quarter. Conspicuous by their absence within the figures and financial data revealed last night were any specific numbers relating to the Microsoft Surface and Windows Phone 8 system. However during the company’s conference call following the results CFO Peter Klein spoke about expanding the range of Surface devices. 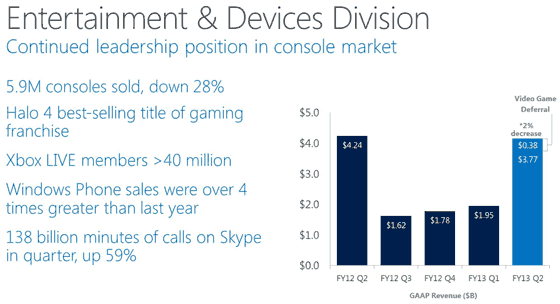 Microsoft profits were down 3.7 per cent compared to the same quarter in the previous year. The profit of $6.38 billion (about £4 billion) was slightly better than market forecasts, helped by record revenues of $21.5 billion. The record revenues were heavily impacted in the Q4 by a big spend on promotional activity, advertising and marketing. Sales of the Windows 8 OS helped the Windows arm of the company enjoy revenues around 25 per cent higher than in the previous quarter. However the Office division showed a decline, probably due to the latest version of the productivity suite being on the horizon during the quarter, the Office Upgrade Offer and people being able to enjoy the free trial/preview. The results also show the decline in the sales of Xbox 360 consoles even though it is a relatively good seller within the whole console market. Finally, we know the launch of the Surface Pro to be just over a fortnight away but it seems like there will be a few more members of the Surface family on their way. Microsoft’s CFO Peter Klein talked of lots of expansions to come in regard to the Surface; “We're going to expand geographically, we're going to expand the product line-up, we're going to expand retail distribution and capacity.” I shall repeat that - the Surface product line-up will be expanded! I hope he doesn’t just mean more tattoo design touch covers. 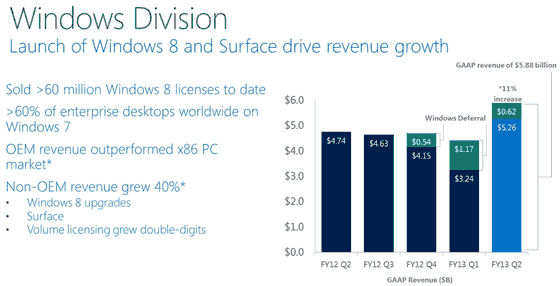 When he was tackled with questions about the popularity of the Surface so far, as there were no specifics in the results, Klein responded that “Certainly this quarter it was a contributing factor to revenue growth in the Windows business.” Also he commented that Windows 8 touch-devices in general were in great demand and often couldn’t be produced fast enough by manufacturing partners.